Sog is a non-profit organisation aimed at the protection of Grey Squirrels. 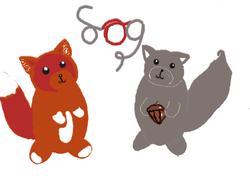 Sog was thought up three years ago by its founders Emily and Evie (web alter ego). The organisation aims to stop cruelty to these creatures and to find a vaccination for the deadly Squirrel Pox Virus. These are all myths Grey Squirrels mainly stick to a stable diet of tree bark, nuts, seeds and forest fungi. They wouldn't need to go hunting for Red Squirrels. Grey Squirrels have a far more varied diet than their red cousins as they are able to digest things that Red Squirrels can't. There for these animals can eat more. They are not taking the food away from the other squirrels. SOG is not a Charity. We are trying to get as many members as possible to get recognition.